I was going through some stuff in the shed when I came across my husband's old booster club jacket for a local minor league hockey team. The front of the jacket was covered in pen stains as he wore the jacket to sell 50-50 tickets back in the day. 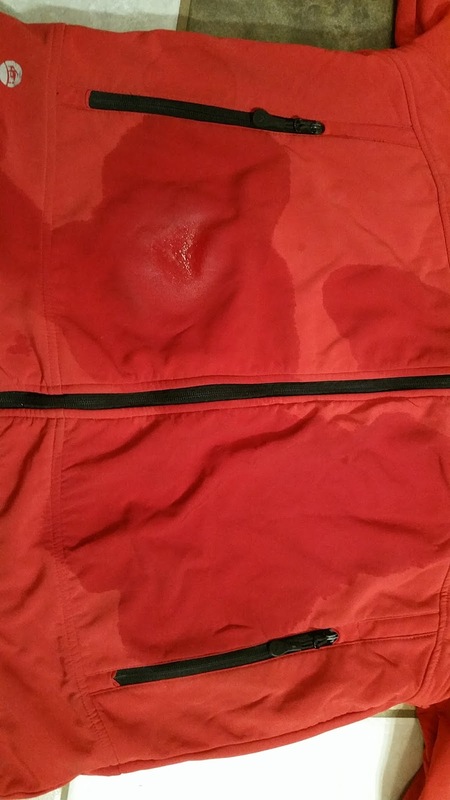 Other than the pen stains, the jacket was in perfect condition and of very nice quality, so I thought I would try to clean it for him. The result from my little experiment was so amazing that I just had to share it with you in case you find yourself in a similar situation. *I would recommend using 99% Isopropyl rubbing alcohol instead of the more commonly sold 70% as it contains more alcohol and therefore will have more cleaning power. If you cannot find 99% isopropyl alcohol locally, you can purchase it on Amazon by clicking HERE (Amazon Affiliate Link). 1. Lay your stained article down on a protected surface. I just used my tile floor as I knew it would not be damaged by the alcohol. 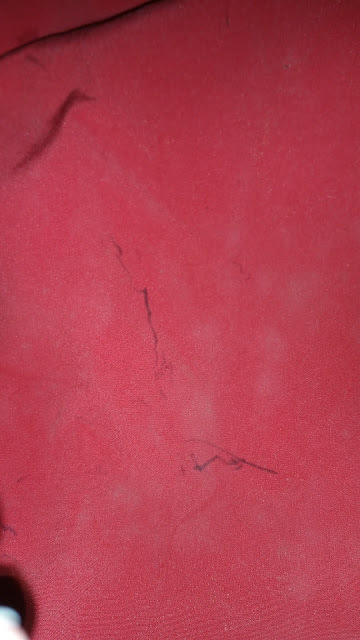 Look at all those ink stains and dust too. 2. 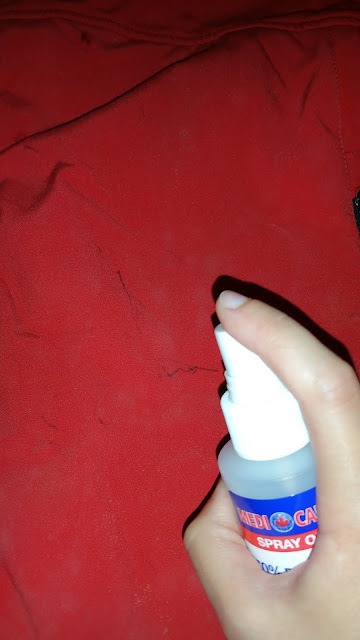 Pour some of the rubbing alcohol into your spray bottle. 3. Spritz the stains generously with rubbing alcohol until the stains are completely saturated. *** If this is a clothing article that is delicate or highly sentimental, I would strongly suggest testing this method in an inconspicuous area and then wait 24 hours and inspect, to make sure this method doesn't damage the fabric. If you are concerned, you can also take the article to a dry cleaner. 4. Use the cleaning cloth to press the alcohol into the stain, make sure to blot and press, do not rub. 5. Spray more alcohol until it's saturated again. 6. Let the item sit with the alcohol on it for 30 minutes. 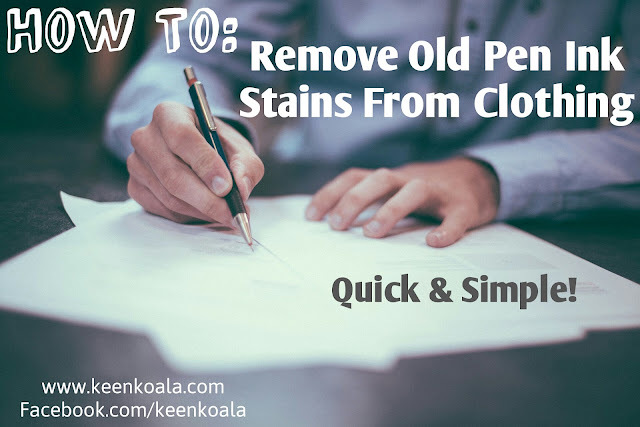 Don't rush ahead and skip this step as the alcohol needs this time to break down the stain and lift it out of the fabric. 7. When you come back you should see that the stains have disappeared. If they haven't, you can spritz with alcohol again and then let it sit for another half an hour. 8. Once the stain has lifted, wash the article as you normally would. 9. Instead of drying the item in the dryer, hang it to dry so you can inspect for any missed stains when it's dry and then treat again if necessary. I hope this tutorial was helpful. For more tips and tricks make sure to LIKE Keen Koala on Facebook by clicking HERE!